Round the back of the refurbished and extended St Pancras station lies a secluded garden made up of the Old St Giles' burial ground and the churchyard of St Pancras, a quiet spot shaded by plane trees. 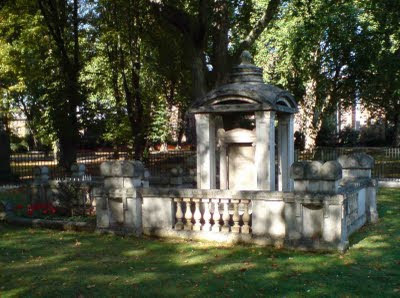 Apart from two men sweeping leaves I had the place to myself, and I was certainly the only person there interested in making a pilgrimage to this small but oddly influential English building, the mausoleum of the great architect Sir John Soane and his family. It's a typical Soane structure in its very personal Classicism, its handling of spaces and layers, its shallow dome, and its symbolism. His wife having died in 1815, Soane conceived this building in the following year. It is a series of layers. 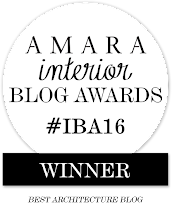 Innermost is a large chunk of Carrara marble; this is roofed by a small marble structure consisting of four Ionic columns and a canopy; this in turn is covered by a larger structure in Portland stone with a shallow dome; the whole is surrounded by a low wall. The dome's finial is a pine cone (a Classical symbol of renewal) surrounded by a snake swallowing its tail (symbolizing eternity). The monument is a fascinating bringing-outdoors of several of Soane's interior obsessions – domes, narrow spaces, those segmental slivers beneath the dome, the symbolic language, and so on. It's arresting, seems simple until you examine the careful and complex art with which it's put together, is completely non-Christian, and very typical of its architect's vision. Soane, though, deeply in mourning for his wife and troubled by domestic arrangements and disputes over her effects, found it hard to visit the monument once it was up. Architectural pilgrims, however, have no such qualms. No doubt one of the most admiring was Giles Gilbert Scott, whose classic design for the red telephone box seems to have been heavily influenced by the monument. How odd that this rarified and personal design should have inspired the creation of something so universal, that the language of mourning should be translated into a symbol of communication. 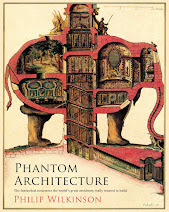 Such are the anxieties of architectural influence, and such are their satisfactions. 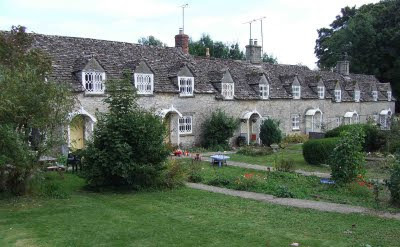 This row of houses in a Cotswold hamlet is, like most traditional buildings on the Cotswolds, built of local oolitic limestone. Classicists among you will recognise in the word ‘oolitic’ Greek words for ‘egg’ and ‘stone’. Oolitic limestone (or oolite for short) is made up of millions of tiny round, egg-like fragments, each of which consists of a roughly spherical build-up of calcium carbonate around a core. 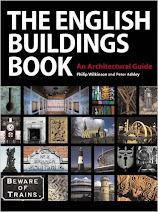 It makes one of the most beautiful of English building stones and buildings in this material grace towns and villages running in a belt right across the country from Dorset to Lincolnshire. As with most Cotswold cottages, limestone makes up almost the whole structure: there are limestone walls, limestone ‘slates’ on the roof, and little limestone-roofed dormer windows. But two distinctive features make this row of probably early-19th century cottages stand out. The first is the hexagon-pattern glazing. Although unusual this is seen on several buildings in this and the neighbouring village and is presumably the ‘house style’ of a local estate. The other feature is the little white porches. Many cottages have small wooden porches protecting the front door. But these have elegant curved roofs made, of all materials, of corrugated iron. Limestone and corrugated iron: an unusual combination, but it works. To build is to be optimistic. You are investing time, money, and effort in an unknown future. To build during a time of war entails an extra dose of optimism, of bravery even. Relatively few major buildings (big houses, churches, and so on) were put up during the English Civil War, and those that were are still pointed out and cherished. That round and optimistic declaration was placed smack in the middle of the facade beneath the dormer window. Here it remains, although it's not in the middle any more because the right-hand portion of the building, with its big gable, is a later, harmonious, addition. The lovely two-tone stripes of local stone have worn well so far, justifying Miss Leeson’s confidence, the warm, toffee-coloured marlstone and paler oolite combining well as in so many villages of southern Northamptonshire. The stone-mullioned windows too help make this building an adornment to its end of the village. 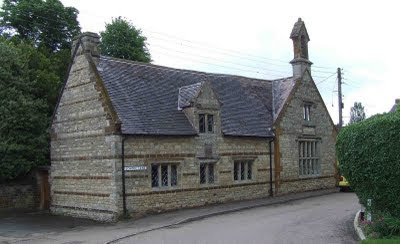 The building is not a school any more, but, used as a village hall, its service to the community continues. Here’s the Round Tower lighthouse at Burnham, or what’s left of it, for all that remains is the tower’s truncated stump, attached to the white building on the left, which faces on to the sea front. Apparently the light had humble origins. 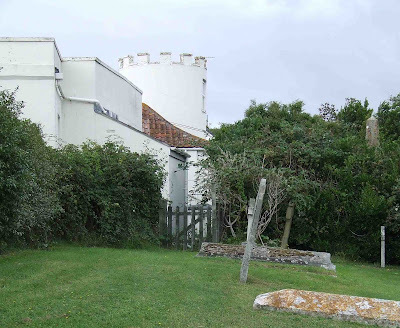 A fisherman lived in a cottage somewhere near this spot in the mid-18th century, and his wife got into the habit of lighting a candle and leaving it at one of the windows to guide her husband home. Later the light was placed in the nearby church tower, so that it could be seen from further out at sea. 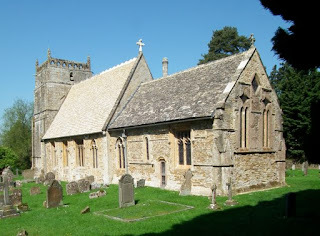 Finally the curate of the church built the round tower – next to the churchyard, as can be seen in the photograph – so that the light was clearer still. 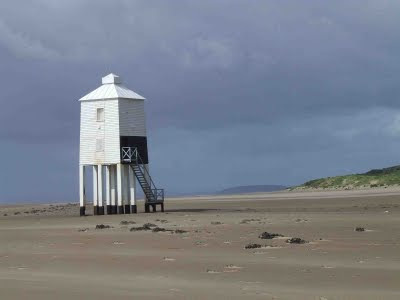 Even in its original tall form it wasn’t that high, and in 1832 it was replaced by the subsequent lights, so that shipping might be guided more reliably home, either to Burnham itself, or on up the River Parrett to the port of Bridgwater. I normally leave this kind of thing to Peter Ashley, over at the excellent Unmitigated England, a fine photographer of lighthouses as of much else. He would not have parked at the far end of the sea front, leaving himself with a twenty-minute walk across a deserted beach in a stiff wind blowing tons of dry sand in a landward direction. A few hundredweight of this sand lodged itself in my nostrils and ears, more of it sandblasting my face and probably my camera lens too. But in the end, buffeted and battered, I made it to the Low Light, Burnham’s sea-shore lighthouse on poles. This unusual structure was built in 1832. It was the third lighthouse in the town, replacing the Round Tower slightly inland, which now survives at half its original height, and complementing the High Light, a more conventional pillar lighthouse not far away. On its nine timber posts it has held up very well, surviving both the Round Tower and the High Light, which blinked its last in 1993. The staircase is a recent replacement in galvanized steel. It takes the same form as the original wooden stair, but has openwork treads so that the load of water pressure on the structure is not so great at high tide. A light is still displayed through the window at the side of the Low Light, so it remains useful to shipping as well as a notable landmark for those walkers who are rash enough to brave the Burnham breeze.